All of Farview Farms animals are processed at a USDA inspected facility. All meat is custom cut, packaged, frozen, marked and ready to take home. The meat is available in quarter, half and whole units. Also available are smaller sized family packages. 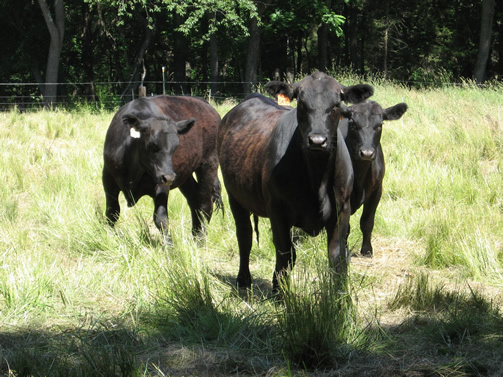 Farview Farm Angus beef is all natural, we put no antibiotics or hormones in our animals or feed. Beef quantities are sold by the hanging weight. A whole steer hanging weight is approximately 800 lbs. 25% to 35% of this is lost to processing. Therefore, the steer will yield about 600 lbs. of take-home meat. Deposits taken in June for November pickup. A 1/4 of a whole will need about 6 cubic feet of freezer space. The table below is based on a hanging weight of +/- 800 pounds. 25% to 35% of this is lost in processing. Therefore, the amount of take-home meat is approximately 600 pounds, but can be slightly more or less. Liver 18 lbs. Hamburger 172 lbs. Rib Steak 19 lbs . Short Ribs 23 lbs. Brisket 24 lbs. Flank Steak 12 lbs. Chuck Roasts 32 lbs. T-Bone Steaks 29 lbs. Chuck Steaks 63 lbs. Porterhouse 12 lbs. Bottom Round 35 lbs. Sirloin Steaks 48 lbs. Eye Round Roasts 12 lbs. Sandwich Steaks 20 lbs. Top Round Roasts 23 lbs. Soup Bones 24 lbs. London Broil 16 lbs. Heart 18 lbs.